one of the hottest races in the fiercely competitive world of microelectronics has been for the development of bright blue and green light-emitting diodes ( led ) and laser diodes. Most of the big electronics companies in the world, including rca and Sony have been involved in the research for a commercially viable blue led . But ironically, they have all been beaten to the post by a small Japanese company, Nichia Chemical Industries, which has developed commercial blue led s using gallium nitride ( gan ). For almost 25 years now, researchers are looking at various materials which are suitable for blue and green semiconductor diodes. The applications are wide ranging -- from flat displays to optical data storage.The materials tried were mostly what are called ii-vi compounds like zinc sulphide and zinc selenium. But it was soon realised that these materials were unsuitable for commercial products because of their short lifetime. It was in the early '70s that scientists at rca first demonstrated electro-luminescent diodes based on gan. Though many groups continued to work on the idea, there were several problems which had to be surmounted before a commercial product could be developed. These included finding a suitable substrate for crystal growth and thermal convection problems because of the high temperature which is required for the growth of the crystals. Nakamura and his colleagues at Nichia have been working for several years on surmounting these problems with gan diodes. They have invented a dual-flow reactor which improves the growth of the crystals in the metal-organic chemical vapour deposition method. They have also used nitrogen, instead of ammonia for annealing which has resulted in better p-type doping in the material. 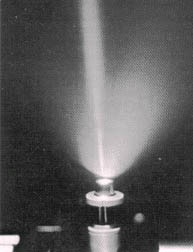 In 1991, Nakamura reported fabrication of bright blue and green led s and recently he has reported the development of a room temperature, pulsed current injection blue laser diode. Though the product is not yet commercially available, there is a lot of excitement in the research community over the discovery. The gan leds convert electricity into light with an efficiency which is lower than that of fluorescent light. Furthermore, with the availability of blue light the gap in the spectrum of semiconductor light emitters will be filled leading to full colour displays. The magneto-optic data storage industry is also anxiously waiting the commercial release of the product. cd-roms with a data density of about four times those currently available will become a reality with the blue gan laser diodes (Science , Vol 272, No 5269).